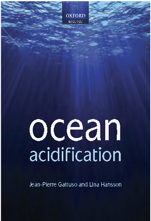 Ocean acidification resulting from anthropogenic CO2 has led to severe threats to marine biodiversity and ecosystems. Therefore, an effective CO2 sensing system is necessary for marine environment monitoring. In this study, polyaminefunctionalized polydiacetylene was synthesized via the conjugation of 10,12-tricosadiynoic acid (TRCDA) monomers with diethylenetriamine (DETA), and its capability for CO2 detection was demonstrated. The structure of TRCDA-DETA was confirmed using nuclear magnetic resonance spectroscopy and high-resolution mass spectrometry. Then, the colorimetric and fluorogenic responses of TRCDA-DETA vesicles were examined by applying CO2. A specific color transition with a colorimetric response (CR%) of 34.39±1.46 was observed within 3 min of CO2 exposure as well as detecting fluorescent response upon CO2 detection coincidently. 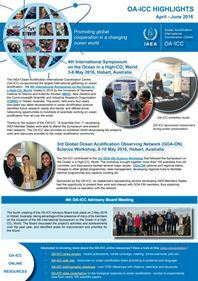 These results indicated that TRCDA-DETA vesicles can be an effective tool for CO2 detection, and their unique properties may have potential applications in multiple fields. Kim K. W., Lee M. J., Kwon Y. M., Choi T.-Y., Kim J. Y. H., Bae S. & Song J.-A., 2018. Polyamine-functionalized Polydiacetylene (PDA) vesicles for colorimetric sensing of carbon dioxide. Macromolecular Research 26(3): 284–290. Article (subscription required).